October is another month with 31 days. You know what that means, right? On Wednesday, October 31st, you can get a scoop of ice cream for only $1.50! (Waffle cones and toppings are extra). This is subject to participation so your store may not be participating. 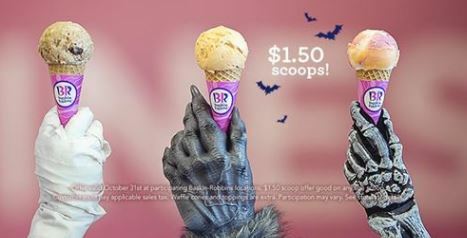 But it is posted on Baskin-Robbins website – so hopefully all locations are participating. Next post: PINCHme Sample Tuesday is October 16, 2018! | Sign Up Now So You Don’t Miss Out!